After an extended period of cool and rainy weather, the end of spring appears to be in sight. The 10-day forecast for the Upstate shows high temperatures between 80 to 87 degrees F and only an occasional chance for an afternoon thunderstorm. 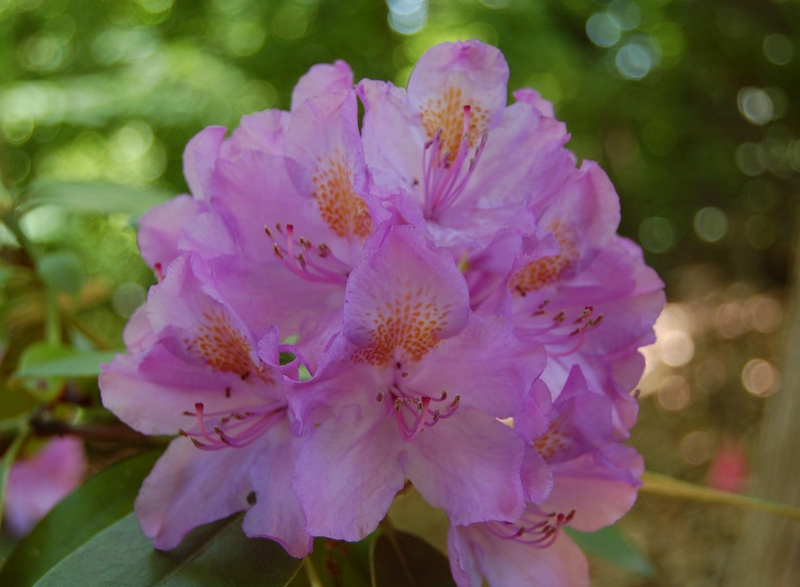 In my garden, where shade dominates, winter and spring are the primary seasons for blooms. Even still, there are a handful of flowers worth sharing now. ‘Summer Beauty’, a hybrid of Acanthus mollis and Acanthus spinosus. 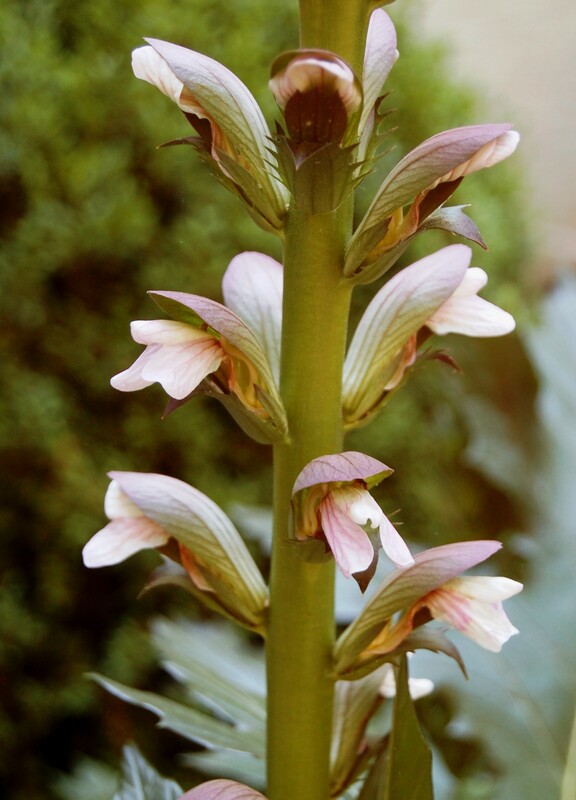 Chief among these is Acanthus ‘Summer Beauty’. This hybrid plant was chosen for a feature spot near the front door, where its attractive foliage adds year-round interest. Bloom spikes, which began to appear about 6 weeks ago, now stand 5-feet tall. 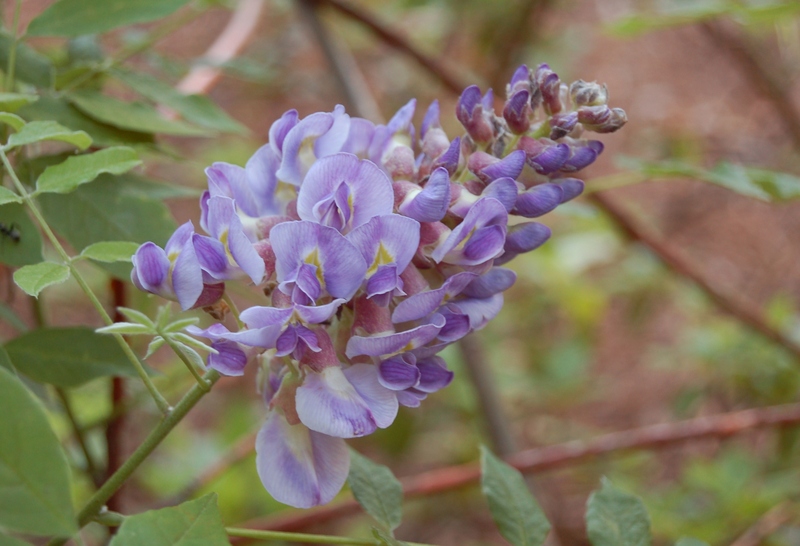 Along each stalk, white blooms peek from under a purple hood (calyx). Blooms of Summer Beauty peek from under hoods. 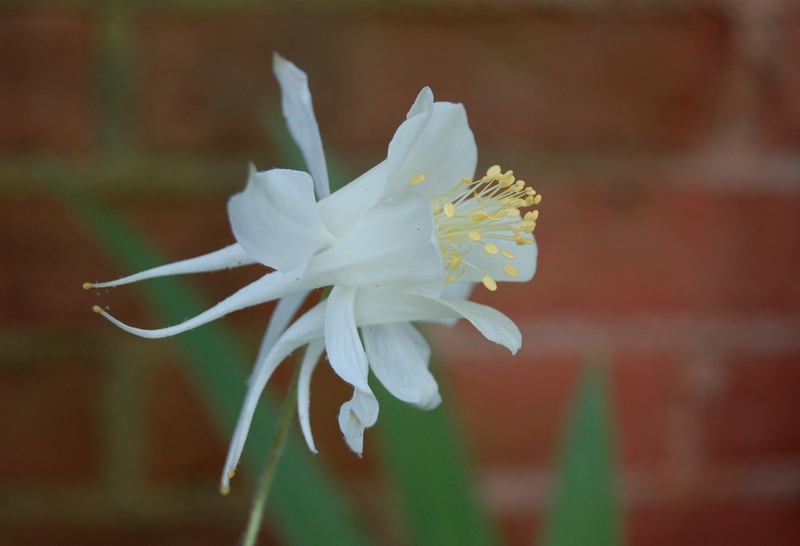 Other flowers in the ornamental garden (which circles the house) include a native wisteria ‘Amethyst Falls’ (W. frutescens) and columbine ‘Crystal Star’ (Aquilegia caerulea). 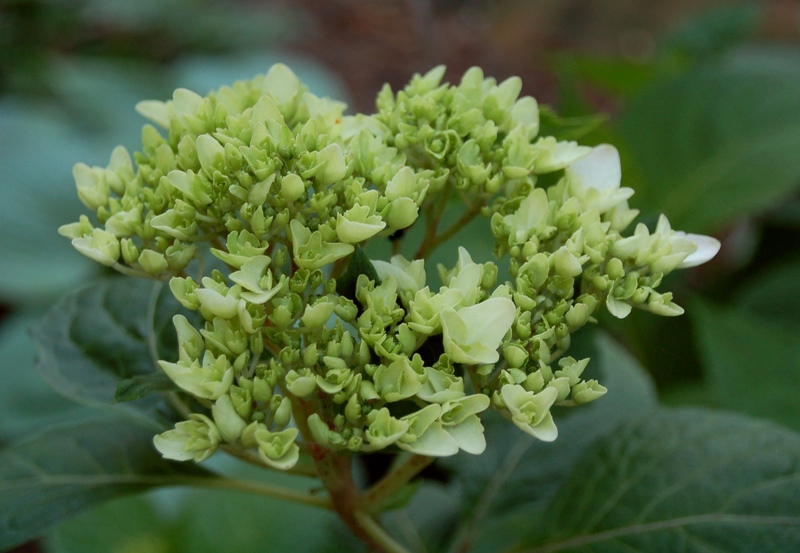 A number of hydrangeas are also beginning to show their stuff, including this bigleaf hydrangea (H. macrophylla). 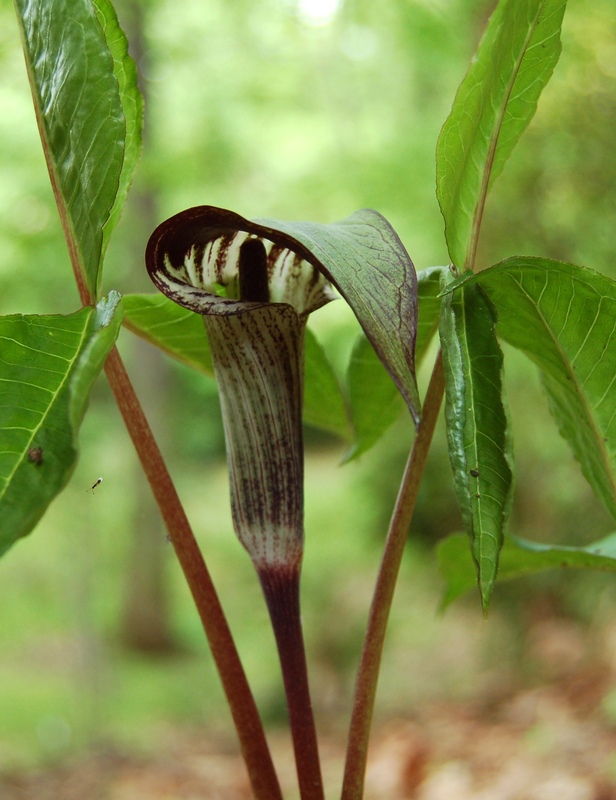 In the woodland garden, eye-catching Rhododendron is in its glory, but it is the shy Jack-in-the-Pulpit (Arisaema triphyllum) that is the superstar. To see what’s blooming in the rest of the world visit the host of Garden Blogger’s Bloom Day—Carol at May Dreams Gardens. This entry was posted in Gardening, Nature and tagged 'Amethyst Falls' wisteria, Acanthus 'Summer Beauty', Acanthus mollis, Acanthus spinosus, Arisaema triphyllum, bloom day, columbine 'Crystal Star', Hydrangea macrophylla, Jack-in-the-Pulpit, Rhododendron, Wysteria frutescens on May 15, 2013 by Marian St.Clair. Holy smokes Marian….what have you been feeding that thing?! It’s magnificent. Beth–I’m as surprised as you are! I planted it in the autumn of 2011. Last year it only had one spike. What a difference a year makes! I’m envious of the Bear’s Breeches. Mine, after about 8 years, has never bloomed. But I’m not giving up! Susan–Is yours a Summer Beauty? I hear the A. mollis is much harder to grow. Mine gets about 2 hours of light in the middle of the day as the sun crosses over the house. It likes lots of moisture and will wilt in summer if not well watered. Your Acanthus is striking feature for your visitors. Amazing. The wisteria is lovely. I have tried bears breeches several times but haven’t found a spot where it will survive. Yours is gorgeous. Happy GBBD. Lisa–if you haven’t gone with the hybrid, give it a try. Summer Beauty is much easier than A. mollis. PBM–one of the best things about this plant is that no one is quite sure what it is. I’m not a plant collector (my primary interest is design), but I think after a certain point in a gardener’s development they should have a few “special” plants that push the garden up a notch. 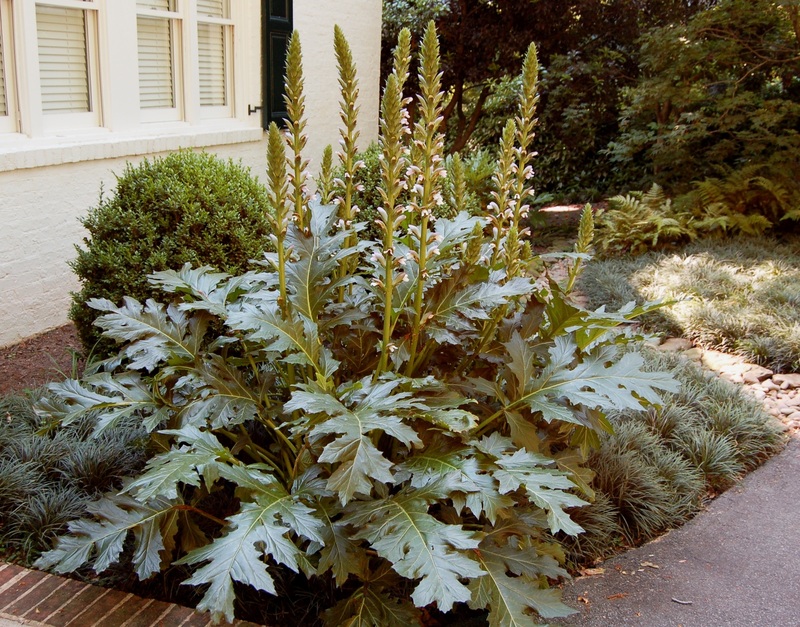 Beautiful blooms…and that Acanthus certainly earns its spot of honor! I also have an Acanthus, mine is Acanthus spinosus and last year it had 13 spikes of various sizes! I think I need to split it soon, it is getting too big for its spot. I also grow arisaema, Arisaema amurense. I have a 60/40 shade/sun garden so a lot of my plants are for shade and semi shade. Take care, Helene. Hey Helene–I’ve visited your blog too. You’re right, I think we’re growing a lot of the same beautiful plants!